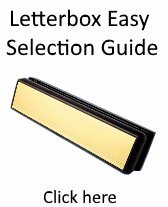 Not sure which UPVC letterbox you need? Letterplates as some people call them, are great when they work but when the spring breaks especially on UPVC Doors, the letterbox turns into a heat guzzling animal. Every time the wind blows your letterbox starts rattling. When the kids run out of the door and all the double glazing at the the front of the house rattles, the letterbox carries on long after. Our letterboxes suit 99% of upvc and aluminium doors and they are available in white, silver, chrome, black and gold. Whilst we can’t guarantee to stop the postman stuffing half a rainforest through your door we can help to cut down the draughts coming through your double glazed door.Its incredibly easy to fix a broken letterbox, just a 10 minute job.